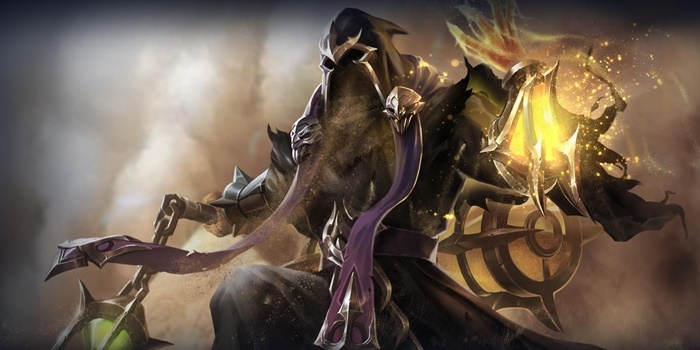 Guide for the hero Azzen'Ka, a character in Arena of Valor (AoV). Included are Azzen'Ka’s abilities, statistics, attributes, strengths, weaknesses, and more. These are Azzen’Ka’s attributes on the mobile version of Arena of Valor. Click here for his attributes on the Nintendo Switch version. Azzen’Ka summons the shifting sands to attack his enemies, dealing 350 (+0.9 AP)ˀ magic damage and knocking them into the air. Delay of Sand Punch is 0.6 seconds. Azzen’Ka sends a Dust Devil towards his enemies, bouncing between them and dealing 235/285/335/385/435/485 (+0.65 AP) magic damage. The same target can be hit up to 2 times, only taking 80% damage the 2nd time. Attack does not activate if there are no enemies in sight. Azzen’Ka calls forth the hand of shifting sands, dealing 200/260/320 (+0.7 AP) magic damage initially. The sand then starts to rage, continuously dealing 140 (+0.35 AP) magic damage to enemies within the target area and slowing their movement speed by 60%. Damage activates but follow up attack does not trigger until it reaches the end of its path. Enemy heroes immediately trigger follow up attack on hit. When using Azzen’Ka, pay attention to enemy positioning so you can chain your attacks. Perform a combo of normal attacks to trap them with his passive and follow it up with Dust Devil. Our recommended order for Azzen’Ka abilities as he levels up. See all of Azzen’Ka’s item builds.